The deeper flaw in the comparison concerns history and precedent. Obama took office as the economy was in “free fall” (as some say), free fall from a long period of mediocrity. At the very peak of the George W. Bush expansion in the summer of 2008, the economy had grown all of 1.9% per year since the 2000 peak. In the six years since the summer of 2008, the economy has grown 1.1% per year. The long period of mediocrity, at least as goes the favorite macroeconomic statistic (GDP), that preceded Barack Obama has only become entrenched at worse levels in the years of this presidency. 1.9% per year was in fact the yearly growth rate in the nine-and-a-half year period that preceded the implementation of Ronald Reagan’s economic policies. From the peak in mid-1973 until the trough at the end of 1982, that was the number, basically the same thing that President Obama would have to deal with on assuming office in 2009. However, in Reagan’s case, 1973-82 also saw a whopping 120% increase in consumer prices (8.3% per year), a doubling of the unemployment rate (in the context of increased labor-force participation) to near 11%, stocks down a quarter in nominal and two-thirds in real terms, a soaring of the prime rate past 20%, and oil up 14-fold in price. And they key date of comparison is 1982—Reagan’s second year, not 1981. Reagan took office in January 1981, all right, and got his major piece of economic legislation through Congress that August: his tax-cut bill. That tax cut bill had been knocking around in Congress, under Rep. Jack Kemp’s tutelage, since 1977. When Sen. William Roth agreed to cosponsor it in that year, his condition was that it be spread over three years, instead of coming all at once. The bill Reagan was able to wrest from Congress in the summer of 1981, after it and an accompanying spending bill got stocked with pork and favors for all the Members (the subject of David Stockman’s famous book The Triumph of Politics), was a three-year tax cut. There would be a 5% income tax cut effective the last three months of 1981, 10% effective the next July, 10% in July 1983, and indexing of income tax rates against inflation beginning in 1985. There was a 5% tax cut in 1981—a year of 10% inflation, meaning that there a real tax increase. In 1981-82, the United States endured a terrible recession, possibly worse than what we had to deal with in 2008-9. The Rust Belt got hollowed out of jobs as unemployment cruised toward 11%. This is when the Democratic House drummed up pressure to cancel the forthcoming tax cuts. Reagan engineered a compromise whereby those cuts would keep on coming in exchange for excise taxes on items such as telephones and airline tickets. When that compromise was made, in the summer of 1982, it became clear, for the first time, that Reagan’s marginal tax cut plan would see itself to fruition. Simultaneously, the Federal Reserve made a decisive shift. Having been experimenting in the array of policy options since Paul Volcker had become chair in 1979—tightening money, imposing quantity targets and credit controls, raising interest rates—the Fed, at the same time the July 1982 tranche of the tax cut came in, started to follow commodity and gold prices. When these prices fell, the Fed loosened; when they rose, the Fed tightened. The stock market was the first to pick up on what was going on. Over the last five months of 1982, the Dow gained 35%. In 1983, a remarkable run began. GDP increased at 3% or better for the next thirteen quarters (a span of over three years), with five consecutive quarters in 1983-84 coming in at over 7%. Inflation bounded down to a third of the 1970s level, as unemployment jumped down from ledge to ledge as the labor force expanded. This run foretold permanence. From 1982 to 2000, stocks went up 15-fold, thirty million new jobs came on the scene, economic output went up at a long-term rate of 4% per year, an entrepreneurial and technological revolution occurred, and the federal budget easily tipped into surplus as federal spending shrank in the context of a nation getting ever more successful. One mild and brief recession (in 1990-91) marred the run. There was mediocrity and worse in the decade before Reagan got his policy enacted, and a shift into a permanent boom afterward. In our own time, there was a nearly decade-long period of underperformance, and when the new president, in 2009, got his policy fully enacted, the result was a reprise of the old mediocrity. The only way that the Reagan record can be seen to be in the same universe as Obama’s is to pass over the inflection points. The trough in the Obama period came as soon as the new president took office; in the Reagan era, eighteen months in. The difference lay in the response to the troughs that came with the enactment of each president’s vision. Obama tried stimulus spending, non-marginal tax cuts, and Federal Reserve activism. The recovery that came does not even rise to the level of the ordinary. 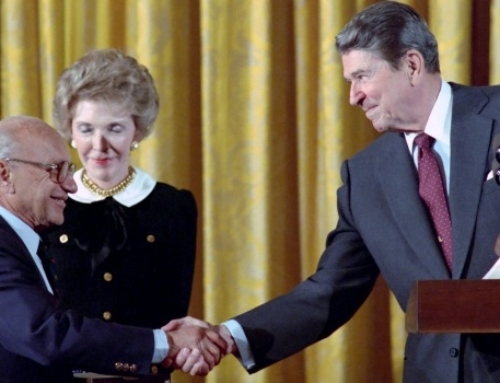 Reagan opted for marginal tax cuts, the Fed followed suit with commodity-based money, and the recovery that ensued remains one of the most powerful of all time. Books on the topic of this essay may be found in The Imaginative Conservative Bookstore. This essay first appeared in Forbes and is republished here by gracious permission. Absolutely. The stimulus didn’t stimulate anything. It was a drag, on the economy and given the restrictions placed on banking, the Obamacare fiasco, and a general sense that the United States is powerless abroad, this economy has been horrid. As has this presidency.